Map of Texas and adjacent regions, with numbering plan area 281/346/713/832 highlighted. Area code 713 was one of the original area codes established with the North American Numbering Plan in October 1947. It originally covered the entire southeastern quadrant of Texas, from the Sabine River to the Brazos Valley. On March 19, 1983, the area was divided for the first time. The immediate Houston area retained area code 713, while the northern, eastern and western portions of the old 713 territory became area code 409. On November 2, 1996, area 713 was split again, with most of Houston's suburbs switching to area code 281. The dividing line roughly followed Beltway 8. Generally, the majority of Houston itself and most of the suburbs inside the beltway kept area code 713, while 281 served everything outside the beltway. Area code 713 was retained by all cellphone customers in the Houston area. This was intended as a long-term solution, but within two years both 713 and 281 were close to exhaustion due to Houston's rapid growth and the proliferation of cell phones and pagers. On January 16, 1999, area code 832 was created as an overlay for the entire Houston area. At the same time, the 713-281 boundary was merged and area code 281 was turned into an overlay for the entire region. The result was three area codes covering the Houston metro area, with ten-digit dialing required for all calls. 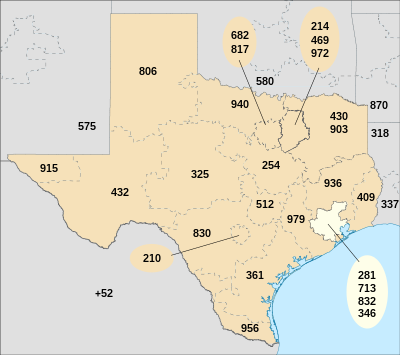 On May 9, 2013, the Texas Public Utility Commission announced that area code 346 would be added to the Houston area as an overlay. This new area code went into service on July 1, 2014. This had the effect of allocating over 31 million numbers to a service territory of eight million people. However, under current projections, the Houston area will not need another area code until mid-2026. ^ Hlavaty, Craig (May 9, 2013). "Houston gets new area code to keep from running out of phone numbers". Houston Chronicle. Retrieved May 9, 2013. Hlavaty, Craig (May 9, 2013). "Wait, area code pride is still a thing?". The Texican (blog). Houston Chronicle. Archived from the original on May 10, 2013. Retrieved October 4, 2018. This page was last edited on 4 April 2019, at 14:29 (UTC).